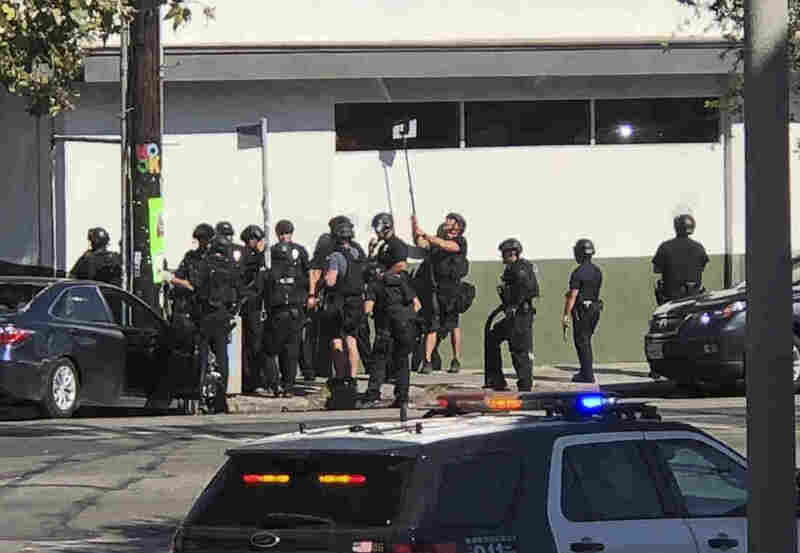 Gunman Faces Murder Charges After LA Trader Joe's Standoff Left 1 Dead Police say the 28-year-old gunman surrendered three hours after he barricaded in the store and held dozens of bystanders hostage in the city's Silver Lake neighborhood. Police officers use a mirror to see inside a Trader Joe's store in the Silver Lake neighborhood of Los Angeles on Saturday. Los Angeles police say 28-year-old Gene Evin Atkins took hostages in a three-hour standoff at the store. The Los Angeles County coroner's office identified the woman who died during the standoff as Melyda Corado, a 27-year-old Trader Joe's employee. Corado's brother, Albert Corado, mourned her loss on Saturday, tweeting that his sister was "my world." No details have been released yet on the cause of her death or whether she was inside or outside the store at the time. In a statement, the supermarket company said Saturday "marks the saddest day in Trader Joe's history," adding that the Silver Lake store would remained closed for the foreseeable future to give employees "time to process yesterday's events." Officials say the incident began Saturday around 1:30 p.m. when Atkins shot his grandmother seven times and injured another woman, whom he allegedly forced into a vehicle at a South Los Angeles residence. He then drove away in his grandmother's Toyota Camry, LAPD Sgt. Barry Montgomery said. According to police, reports the Los Angeles Times, Atkins' grandmother was in critical condition on Saturday, but Atkins' cousin, Charlene Egland told the Times she is expected to survive after surgery. The LA Times reports Egland said Atkins had been arguing with his grandmother over his girlfriend staying at her home. "Egland said Atkins was raised by his grandmother, who repeatedly cared for him despite prior run-ins with police and sometimes violent arguments that would erupt between the two family members," the paper adds. After reports of the domestic shooting, police used a theft-tracking device to find Atkins near Hollywood. "The suspect was located via LoJack and a pursuit ensued at which point the suspect fired multiple rounds at pursuing officers," the LAPD tweeted after the incident concluded. No officers were injured. The chase ended in the gunman crashing into a pole outside the Trader Joe's. That's when the suspect fled the vehicle and hid inside the store. Some customers managed to escape the store with help from police and employees. Footage showed police officers using rope ladders to get people to climb out of windows. Freelance reporter Doualy Xaykaothao in Los Angeles tells NPR the gunman took 40 to 50 people hostage. Twenty-four-year-old Julia Arnold, who lives behind Trader Joe's, tells Xaykaothao she was leaving her house when she saw the chaotic scene. Arnold spoke to a young woman who'd been in contact with her brother, one of the hostages who she heard had been hiding in either a "refrigerator or freezer." LAPD Chief Michel Moore said earlier Saturday that the gunman killed one young woman inside the store. Los Angeles Fire Department spokesman David Ortiz said earlier that a different female in "stable condition" had been taken to the hospital. The standoff ended when the gunman handcuffed himself, said Mayor Eric Garcetti. Via aerial video, Atkins was seen exiting the market in handcuffs. A number of people also left the store; one person was sitting on a stretcher. Garcetti thanked the LAPD and the Los Angeles Fire Department, adding that the heroism shown Saturday was "second to none." "We have successfully taken the suspect into custody without incident," the LAPD tweeted. Earlier Saturday, President Trump tweeted that he's "watching Los Angeles possible hostage situation very closely." Retweeting the president, the LAPD did not dispute his description of the incident as a "hostage situation," but the LAPD had not yet labeled it as such.